Tokyo is an awesome place for food – something about the energetic atmosphere surrounding the city seems to have permeated even eating. One of the most fascinating aspects of dining in Tokyo is the themed restaurants – they are just so interesting and out of this world. In this blog post, I have compiled a list of recommendations for 10 interesting themed restaurants where you can experience the quirkiness of Tokyo and enjoy good food, all without breaking the bank. Most cost around 3,000-6,000 yen per meal, unless you need to pay more for a performance show at the restaurant. 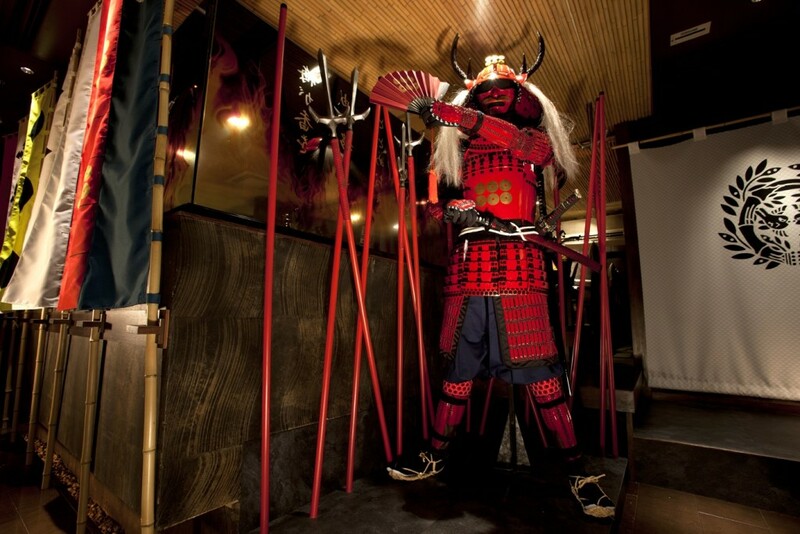 All these themed restaurants are located near Tokyo Metro or JR train stations. 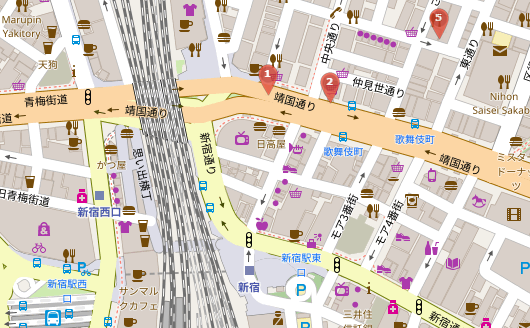 Using “GPSmyCity: Walks and Articles with Offline Maps” app maps, it is easy to navigate around Tokyo to find the restaurants. 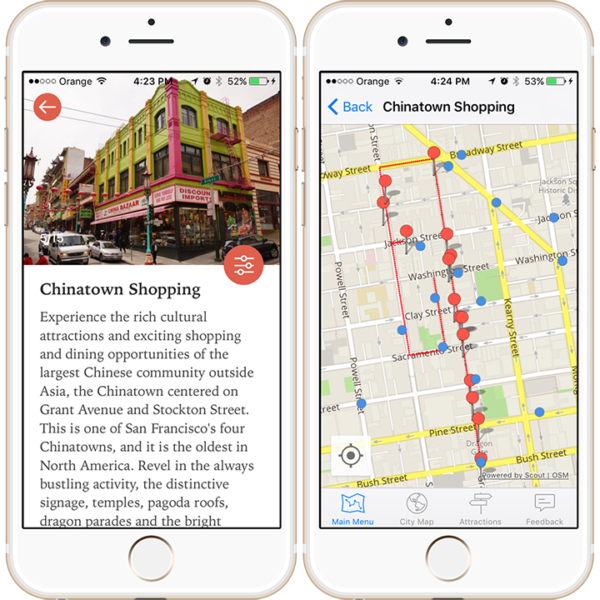 The GPSmyCity app adds downloadable maps and a navigation system that can be used offline to articles contributed by hundreds of travel bloggers from all over the world. The best part of it all is that the GPSmyCity app works offline. So, you can read travel articles about your next destination at the airport or during a train ride, and call upon the built-in GPS guiding service when you need it. You can download the GPSmyCity travel app at the Apple store (only available as an iOS app now). Let’s start with one of the most ubiquitous Japanese characters – the ninja! Not only do famous actors frequent this restaurant, but also movies have been filmed here. The interior is that authentic. What also attracts people is the fact that it is kid-friendly. Kid events are often held, including dress-up time complete with commemorative photographs. Once you sit down and begin to enjoy your Japanese-style meal, there will be occasional mock battles that happen before your very eyes by actors dressed up as ninja. You can choose from a course menu, like the tasting course, shabu-shabu course, or vegetarian course. There’s also an a la carte menu if you would rather build your own dinner. Because the Diet building and Togu Palace is nearby, navigating the area is fairly easy and a highly recommended site for exploration. Ninja Akasaka is also no challenge to find. From Akasaka Mitsuke Station, accessible via the Tokyo Metro Ginza Line (G05) or Marunouchi Line (M13), take the exit for the Akasaka Excel Hotel Tokyu. Ninja Akasaka is on the corner. There are various locations around Tokyo, but the favorite is in Harajuku, Shibuya. So, I am going to tell you how to get there. Address: 150-0043 Tokyo, Shibuya-ku, Dogenzaka 2-13-5 Harvest Building 2F Alcatraz E.R. Alcatraz is either a love it or hate it experience, depending on how much you love horror and whether you want more of a show rather than a meal. Alcatraz E.R. is designed to look like a grimy dungeon with padlocked cell doors, blood-splattered floors and walls, and slightly disconcerting dolls. 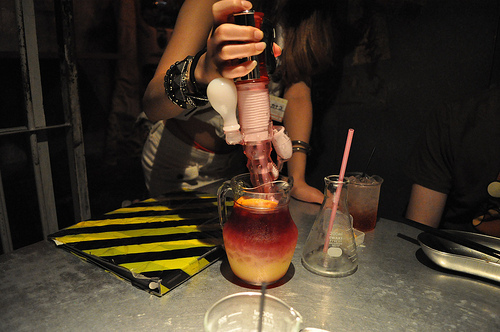 The favorite amongst visitors is the test tube shot glasses that you can mix up yourself and “medical” drinks with syringes, body parts, and other unique presentations. To get here, leave Shibuya Station through the Hachiko Exit. It’s a 7 minute walk from there. Cross the intersection, moving towards Shibuya 109. Stay on the road to the left, moving past Lotteria and RounGe Shibuya. There’s going to be Sound Museum Vision on the left and Kentucky Fried Chicken on the right. Go a little farther, you will see a Family Mart. Make a right down the road in front of the convenience store. Continue straight along the road. Before the curve, you will see the entrance to Alcatraz E.R. 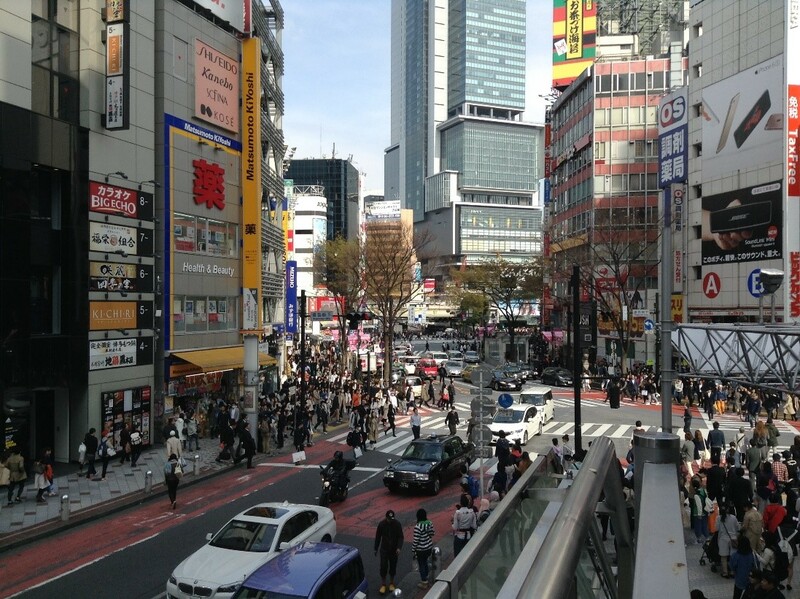 From a veranda on Shibuya 109, looking towards Hachiko. 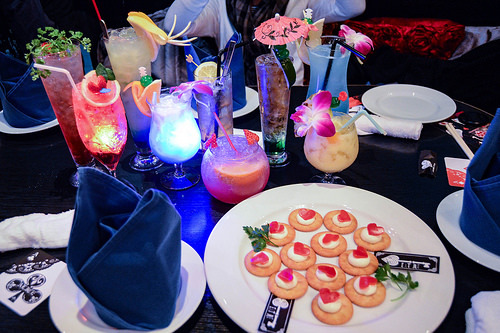 So famous is the Robot Restaurant and its explosion of blinding lights, scantily clad jazz dancers, animatronic dinosaurs, and robots that reservations are a must. When you go to the Robot Restaurant, be ready for an astounding light show mixed with the usual Japanese/American bar food. Depending on the season, the show changes slightly. For example, during Christmas time, there are candy cane ninja and dancing pine trees. It’s recommended to set aside some extra cash for the Robot Restaurant, as the ticket alone is 8,000 yen. Buy online for a discount. (5) Robot Restaurant before you see it, but you can’t miss it either way. Each of GPSmyCity travel articles can be downloaded as an individual app for free, so that you can read it at your leisure even when you no longer have access to internet. For an extra $1.99, you can upgrade the article to a GPS-activated travel guide that will show you in real time exactly where you are on the map and guide you to any location mentioned by the author. The navigation capability requires only your smartphone’s inbuilt GPS. No Wi-Fi or mobile data is required to use the app. I have even more good news for you. All the readers of PassportChop.com (yes – this blog!) can get a free upgrade for a travel article of their choice throughout the period of an upcoming crowdfunding campaign. To get a free upgrade, contact [email protected] and mention that you’ve read about the offer on our blog! Read more details at the end of this blog post. 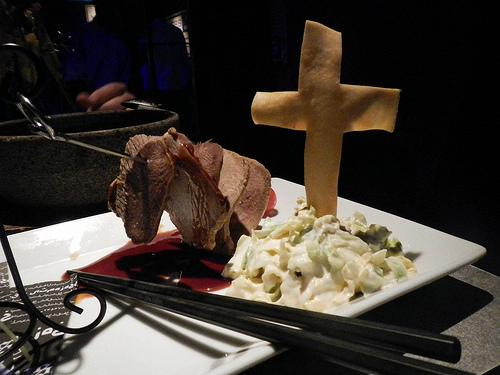 Let’s move on to the next themed dining restaurant which is a lot darker and morbid compared to the Robot restaurant. Another place also located in Shibuya for the horror fans, the Lockup features a slightly alternative approach to Alcatraz. Cave-like walls, lit flooring, clowns in the rafters, and jail cells make up the interior design. As for the food, a lot of the drinks look like chemical concoctions. The food is made to look like body parts, bones, and insects (although slightly more cutesy than Alcatraz); but everything is entirely edible and very delicious. Definitely worth a couple of shares on Instagram too! To make your way here, leave Shibuya Station by the Hachiko exit. Cross the intersection, headed for Shibuya 109. Stay to the right of 109, moving up the road that takes you first by a Family Mart, then an AU phone shop. Where there’s an off road adjacent to an SMBC bank and Camera Kitamura, you will turn right. The Grand Tokyo building is the second building, and the entrance is on the left. The colors, the lights, and the cuteness! Would you expect anything less from the madness known as Harajuku? No! 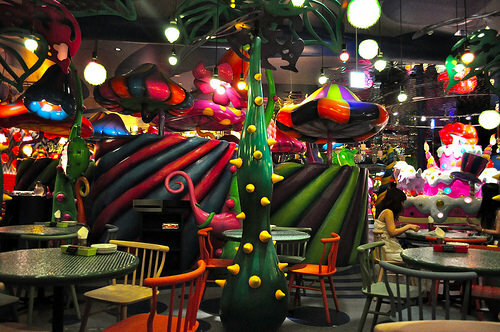 The Kawaii Monster Café is a place where you dine on rainbows and provoke the envy of Willy Wonka. Not only is the staff dressed up like Monster Girls, who aren’t as much terrifying as they are adorable, they are super friendly and love to take pictures with the guests. The fun of the restaurant does not stop there. The interior is decorated to look like candy, and even the regular food looks like something out of a coloring book. Feast on rainbow pasta, a BLT with multi-colored sauces, and even chocolate mole chicken. To get here, take Exit 4 from the Meiji-Jingumae Station off the Fukutoshin or Chiyoda Line. You should come out near LACOSTE L!VE. If you look beyond the intersection, you should see an American Eagle Outfitters and signs for Laforet (a famous shopping mall). Kawaii Monster Café is in the building almost directly across from Laforet and ABC Market. 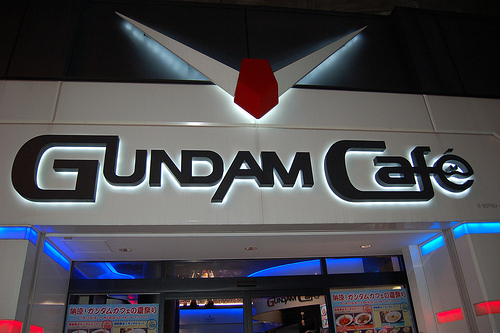 Right in the epicenter of otaku culture in Akihabara is the Gundam Café. Fans from around the globe make a special pilgrimage to this café to drink coffee with Gundam foam art, eat meals shaped like shape ships or get Japanese curry, burritos, or noodles, and indulge in the futuristic interior. Unique Gundam merchandise is also available on site, making this an idea stop for both real life Gundam-world immersion and the souvenirs to prove it. Getting here is very simple. At Akihabara JR station, take the exit for Electric Town. It’s right outside to the right. Across the way is Excelsior Café. The famous AKB47 café is also right next door. Welcome to the Red Queen’s Castle! Velvet everything adds an extravagance to the restaurant that is too hard to resist. Choose between Mermaid Cave seating or the Queen’s Chamber. There’s also Solitaire Card Guards, intricate ceiling décor, and other furnishings straight from Lewis Carrol’s world. Of course, the food follows the theme. You can order delightfully presented glowing cocktails, soup served in a carved pumpkin, White Rabbit pasta, and more. From Ikebukuro Station, it is a 3 minute walk. Leave out of the East Exit and move towards the Don Quijote and Seibu Ikebukuro. Keep going along the road until you hit the MUJI. 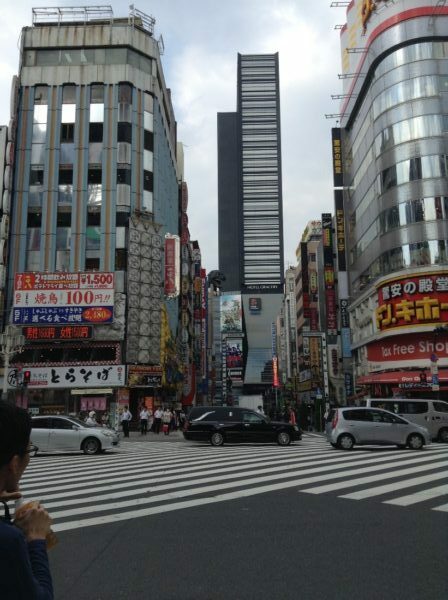 Go up to where there’s a Matsuya and cross the street, moving towards the building with a Starbucks Coffee. Alice in an Old Castle is located in the building next door on the left. Love samurai? One of the best things about Shinjuku is not only the epic Samurai Museum, but the samurai-themed restaurant known as Sengoku Buyuden. After witnessing the awesome history of famous warriors at the museum in Kabukicho, you can make an easy trip to whet your appetite here. There are armor replicas, wartime flags, rice paper sliding doors, and low illumination for a truly Sengoku period feel. To increase the greatness of the meal, be sure to try Sengoku period style sake that the restaurant sells. For the connoisseurs, you may find that the flavor is slightly different than modern day styles. As for the food, be sure to order the Chinmi Santen Mori, a sampler that changes based on what is seasonably available. You won’t be disappointed! To get to the restaurant, start from Shinkuku Station JR East Entrance. It’s about 4 minutes on foot. Move towards Studio Alta and go down the road near the fruit stand, towards Don Quijote. At Donki, you are going to go right, passing the Family Mart. You know you’ve arrived at the T-wing building when you see a Burger King billboard on the left. Head inside and use the elevator to reach 4F. Don Quijote to the right, Kabukicho straight ahead! Not many cat cafes in Tokyo actually serve real food! I’m sure you can guess why—all those paws trying to touch your shrimp pasta and what not! 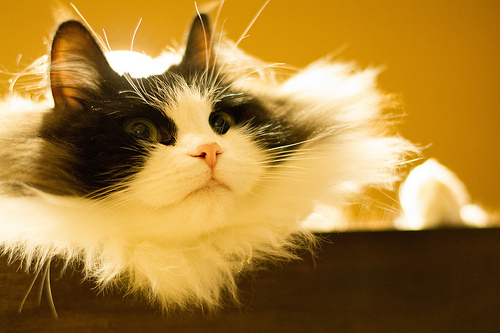 But that’s where Cat Café Calico in Shinjuku is purrfect. You can dine with the friendly felines for a rather low price. For example, the omelette rice is 500 yen, as is the carbonara pasta. You can top it off with a slice of cheesecake for 300 yen and some ice tea for 200 yen. Since the portion sizes are decent for Tokyo, you won’t leave hungry. Plus, you have the love of fluffy and fuzzy felines to keep you satisfied! And, boy, are they cute! To get to this pawsitively great cat café, take the same route you would heading toward the Robot Restaurant or Sengoku Buyuden from Shinjuku Station. However, when you turn right at Don Quijote (ドン・キホーテ), you don’t have to go much farther than that. As you can see on the map below, (1) Cat Café Calico is in the same building next to Pasela Resorts. Look up, past the sign that says 新生銀行レイク. The reception desk is on the 6th floor, but the café is on both the 5th and 6th floors. The entrance fee is 1000 yen. This is what it looks like from the GPSmyCity app. If you want to check out other sights of Shinjuku after your meals at Calico Cat Café, you can tap on a broad range of self-guided walking tours in the GPSmyCity app, which covers popular sights or specialized interests (e.g. cultural landmarks, ancient architecture, religious heritage sites), as well as modern social life attractions, restaurant guides, and shopping lists for souvenirs or local specialties. Thanks to the creation of Kyomachi Koishigure, you can taste the traditional flavors of old Kyoto while never having to leave the convenience of modern day, dynamic Shinjuku. Kyoto of the past was a beautiful place called Kyomachi, where red paper lanterns lined the walkways to bridges and sturdy bamboo was everywhere in sight. This is the scene that awaits you as soon as you enter this unique restaurant, making it a great place to take pictures—and tell everyone you time traveled. 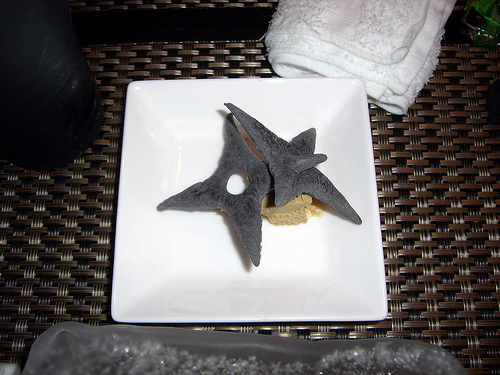 Those who are health conscious will find themselves in love with the menu. True to the customary Kyomachi style, everything is light yet flavorful. Not surprisingly, the sushi offerings and braised meats are among favorites. Also try the vegetables braised in miso broth, Kyoto-style pickles, cooked rice soaked in green tea, and also matcha-flavored desserts. To get here start from Shinjuku station, JR East Entrance, and move for Kabukicho. Turn right by the police box (the koban) at the corner. Make a left at the crosswalk headed towards Megane Super (メガネスーパー). On the other side, head left, and you should see a Comme Ci, Comme Ca store. Make a right there then head for the cinema. Go inside to the elevators. The restaurant is on 6F. This wraps up our list of top 10 interested themed dining restaurants in Tokyo. Read on to find out exclusive PassportChop.com reader deals with the GPSmyCity travel app. GPSmyCity has launched a crowdfunding Kickstarter campaign to raise money to create the world’s 1st GPS-powered travel encyclopedia. The funds collected from fellow travelers will be used to double the number of cities (from the currently available 750 to 1500) until the end of 2017 and to make the GPSmyCity application available for Android smartphones too. As a reader of PassportChop.com, you can get a free upgrade for a travel article of your choice throughout the period of the crowdfunding campaign (January 17th – February 17th). To get a free upgrade, contact [email protected] and mention that you’ve read about the offer on PassportChop.com!